View looking south from Kitt Peak this afternoon shows some blowing dust in the boundary layer, but nothing like yesterday's dust event across the Great Basin and into Salt Lake City. Strong, short-wave trof at 500 mb will cross the state tomorrow with an intense vorticity maximum. A leading S/W will pull rapidly northward across the state during the early morning hours carrying several embedded vorticity maxima with it. So, April begins with another strong and complex storm crossing Arizona and good chances for convective storms and precipitation across most of the state. March summary here at house - north central Tucson near the Rillito Wash.
Rainfall for month 0.88". This makes a first quarter, Jan - Mar, total of 6.62". Many cool mornings during the month with 21 days having lows below 40F and 7 days with 32F or lower - heavy frost and 27F on morning of the 10th. The NWS FD this afternoon notes that TUS observation site at the airport has not had a low temp of 32F or below since December 27th. This fact highlights the strong local temperature variance within the city limits when compared with the lows here. Since Decmber 27th there have been 34 mornings with temperatures of 32F or lower. Coldest morning since the 27th of December was 24F on January 1st. Off to Chicago in the morning - back here next Tuesday. A strong S/W at 500 mb is forecast to cross southern Arizona on Thursday by the NWS NAM model runs this morning - this feature was mentioned below in an earlier post when all the GFS ensemble members were in agreement at longer time frames. The current NAM run forecasts little in the way precipitation at lower elevations across southern Arizona, keeping significant precipitation amounts in the mountains. Thicknesses are forecast around 540 dm, or a bit lower, so snow levels will lower rapidly on the mountains. The 500 mb vorticity advection is forecast to be quite powerful across the Borderlands, and I expect that there may be some visually spectacular convection along the front. Winds will be quite strong with and ahead of this system. Katie and I will be affected by this S/W since we're flying to San Diego on Thursday morning. It will then catch up with us in the Chicago area, where we're headed, on Saturday and Saturday night. There have been quite a few strong fronts that pushed into, or across, the Gulf of Mexico this winter, so I did a quick check of current SSTs. Top graphic shows current SST for the Gulf and bottom graphic shows departures from normal. Indeed, SSTs are below normal over the entire Gulf. SSTs are not normal or above except for well south of the Yucatan Straits in the western Caribbean. Means that early season severe storm outbreaks will need either to pull low-level air northward from very low latitudes or have cooler than usual middle-level temperatures. Something to watch as the pattern transitions next week to high amplitude waves moving into central US. 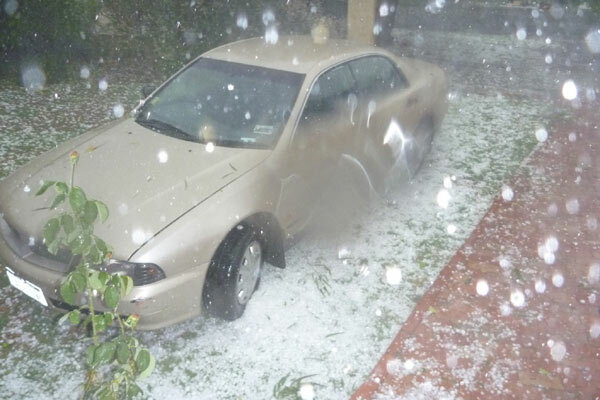 Those of you who follow the SUNY MAP discussion know that there have been two devastating hailstorms in Australia this month - the first in Melbourne in southeast Australia and then, day before yesterday, a very severe storm struck Perth in far southwest Australia. 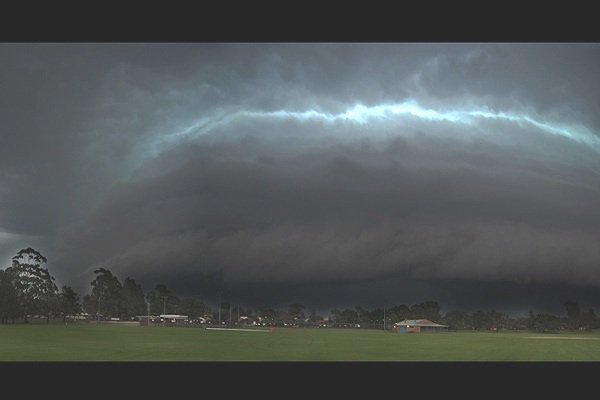 The photos above show the recent storm approaching Perth and hail falling during the height of the storm. What a way to break what had been a long summer drought! Yesterday's showers, and some thunderstorms, affected most of southeast Arizona but amounts were generally only .05" to .15". All of the first order observing sites in southeast Arizona had measurable rainfall, except for the Trace at Nogales, which also had thunder and lightning. Here at the house we had 0.08" with a low this morning of 38F. All of the RAWS stations also had precipitation with Chiricahua NM Headquarters reporting 1.10" and Trail Cabin 0.52" - so amounts were higher in the far east part of the region. More than 80% of the Pima County ALERT gauges also had measurable rain. Thus, POPs of 20% turned out to be very conservative as far as the areal extent of the event. Photo above shows the Huachuca Mountains in a view looking southwest from Sierra Vista - note the very heavy snow cover this spring. Beginning around next Wednesday (March 31st) all of the GFS ensemble members forecast the development of a high-amplitude trough at 500 mb over the western half of the country that persists well into the first week of April. Shown above are the 228-hour forecasts for 500 mb and the surface from the operational GFS valid at 00 UTC on Friday April 2nd. So, with two fast moving S/Ws at 500 mb crossing the central Plains and then the big pattern change, it looks like a quick transition from Spring snow storms to severe thunderstorm chase season! Woke to light showers this morning (Tuesday March 23 2010) as models were slow developing precipitation across southern Arizona. Ground is damp here but only a trace in gauge. Last evening's model runs indicated no rain, or only a Trace to a 1/10", with this 500 mb feature in the southern train of flow, so it remains to be seen if any signifcant showers develop in southeast Arizona. Regional radar shows some stronger echoes in southwest portion of state. Range from radars indicates beams are in the ice/mixed phase portion of the cloud, so the high reflectivities may be somewhat deceptive. However, I note that Phoenix Skyharbor is having moderate rain at this time. So, an interesting day on tap with a warm, low latitude system that has had the models struggling. The unusual spring snow storm has moved across north Texas and central Oklahoma and is focussed on eastern Oklahoma and western Arkansas this morning, with snow reported as far south as northwest Louisana. Very strong cutoff for this time of year. 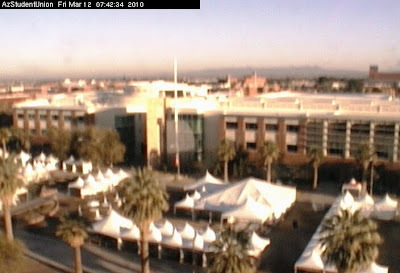 Web cam shot above is in the Quad at University of Arkansas in Fayetteville - Go Hogs! Note the 540 and lower dm heights at 500 mb in the NAM analysis this morning - Sunday March 21st, 2010. Very impressive! 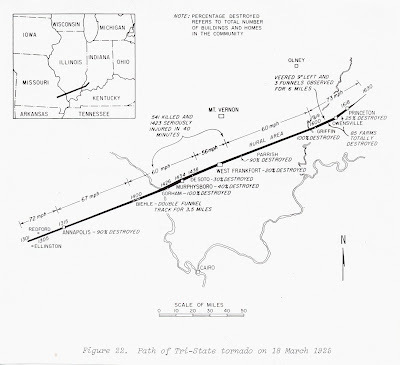 Yesterday afternoon, 85 years ago - March 18, 1925, the most devasating single tornado that has ever occurred in the U.S. struck southeast Missouri, southern Illinois, and southwestern Indiana. This tornado is referred to as the Tri-State tornado because of its path across the three states. 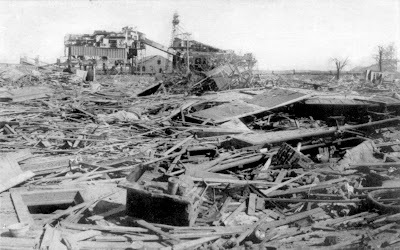 Its path length was over 200 miles and it caused more than 600 deaths. There was a commemorative ceremony yesterday at John. A. Logan College, in Carterville, Illinois, and two of our Tri-State research team - Steve Piltz and Bob Johns - attended. We hope to be publishing results of our studies of the Tri-State event during the coming year. 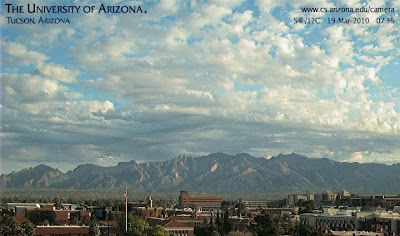 It has been a windy week here in Tucson; dry and sunny and temps that got into the low 80s on Wednesday but lots of wind. Backdoor front from the southern Plains brought 30 to 40 mph easterly winds all day on Tuesday and then again Wednesday morning to most of southeast Arizona. Notable was a gust to 76 mph at the Mt. Hopkins RAWS - perhaps an eddy effect from Mt. Wrightson? - and 58 mph at the Atmo rooftop anemometer. A S/W at 500 mb is digging south across the central Rockies this morning and a strong, separate vorticity max is over southwest Arizona this morning. It's positively tilted and forecast to move quickly past, but has brought high-based cumulus and some ACC this morning - see view of Catalinas above. Perhaps some sprinkles and winds from the west by afternoon. Main part of the S/W is bringing a spring snow storm to Denver and the Front Range today - see top image. NAM progs the 500 mb wave to sharpen and cutoff, bringing a March snow to the southern Plains - indeed this morning's forecast run - if accurate - indicates blizzard-like conditions and heavy snow for central Oklahoma Saturday night and Sunday! 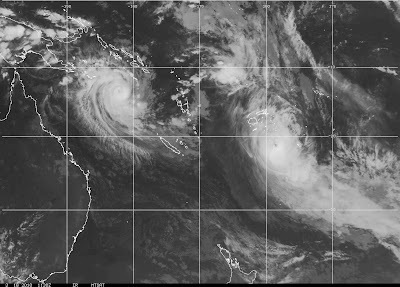 Two tropical cyclones are occurring in the Southwest Pacific today. The eastern storm in image above is - Thomas - which apparently struck the Fiji Islands as a Category 3 storm. The western storm is - Ului - which has been reported as the first ever Category 5 storm in the south Pacific. Ului is drifting slowly but may approach Australia later in the week. The next S/W to impact Arizona will cutoff over Utah tomorrow and then move southeastward toward El Paso, according to this morning's NAM forecasts. This path will keep most of the weather off in the White Mountains. The Festival has a lot of outdoor activities planned and I hope that the winds don't kick up on Sunday afternoon. The tents are setup again in the University Mall out in front of the Union - see above. The gusty squalls of last couple of days tumbled some of tents down the Mall and dropped them into the Integrated Learning Center, but it looks like everything is again ready to go for tomorrow morning. Biggest disappointment is the withdrawl of Larry McMurtry and Dianna Ossana due to health problems - they were Academy Award winners for scripting Brokeback Mountain and Arizona's Tom Miller was scheduled to do an extended interview with them on Sunday. by gusty north to northwest winds. These were associated with the third 500 mb S/W, mentioned in earlier posts, that's swinging across the borderlands and being sucked into the large cutoff over the north-central US. 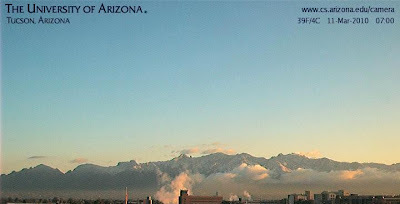 Images above show the Catalinas at sunrise with low snow levels and stratus fractus hanging on the foothills. Bottom plots show the time series of T and Td and pressure at atmo sci building on campus. Very impressive squall signatures for a bit past midnight - wind on roof there was about 45 mph. Rain here at house was 0.17" and it appears that about 70% of the ALERT gauge sites in eastern Pima County had precipitation over night. Amounts generally ranged from 0.04" to 0.20" with a bit more up in the mountains. Coverage and amounts again increased toward the northern portions of the network. Low temp here at house this morning was 30F. Tucson NWS radar came back on line early yesterday afternoon - its return to action was much awaited. Radar loop during the early morning hours shows two distinct echo areas of showers, with some small areas of 35 to 40 dBZ, across the metro area. The TUS ASOS remains dysfunctional. 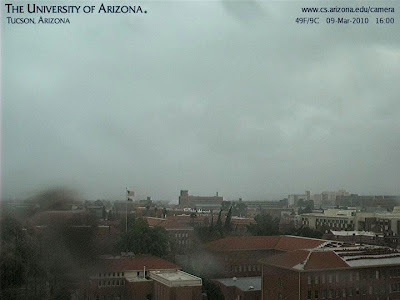 Fast hitting squall line moved across much of south-central and southeast Arizona yesterday afternoon - view above shows the dismal conditions on U of A campus at 4 pm. Here at house temperature briefly dropped to 40F during the rain and winds gusted over 40 mph. Brief burst of rain left 0.12" in the gauge. I see a report of 80mph+ winds in Apache Junction east of Phoenix, Guthrie RAWS had gust to 62 mph, Atmo roof top anemometer hit 58 mph, and Safford recorded a gust to 56 mph - gusts of 30 to 50 mph were common at many of the RAWS sites. Looks like about 75 to 80% of the Pima County ALERT gauges had measurable precipitation but with amounts at lower elevations mostly from 0.04" to 0.15". So, it turns out that 30 to 50% POPs were a bit conservative for metro Tucson area. Quite a wild winter/spring continues with several more S/Ws at 500 mb forecast to swing by, or through, southeast Arizona during the next seven days! The NWS radar and ASOS systems remain out of service. Latest status message says that perhaps radar will be back in service by this afternoon (Wednesday Mar 10th). At sunrise here at house this morning - a very frosty 27F for a low. 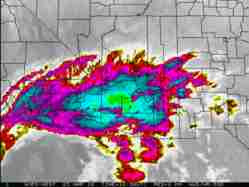 Fast hitting, nasty storm today for southern Utah and Arizona northern and eastern mountains. 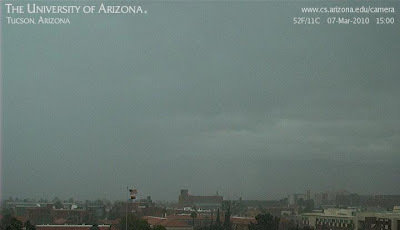 View on top is from webcam looking north from Flagstaff. Strong cutoff and shortwave at 500 mb swings rapidly across north half of state today. Coldest air at 500 mb appears to be advecting into Great Basin; however, very strong cold advection at 700 mb is pushing rapidly across southern California with strong and gusty surface winds. Thus, cold front likely across southern Arizona and current forecast of 30% chance of showers with the front looks quite reasonable, since strongest forcing for upward motion is with the strong PVA north and and also with upslope winds. Three 500 mb waves are scrunched together from off the West Coast to Arizona to Kansas, see NAM 500 mb analysis above, at wavelengths that appear too close together. NAM forecasts the two western S/Ws to rapidly move into, and phase with, the Kansas wave - this too seems very reasonable. Thus, two fast moving shortwaves coming by with rapid changes, gusty winds, and perhaps some visually impressive convective showers. 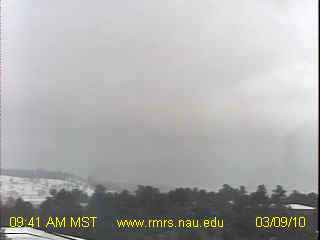 View above from Computer Science web cam at 3:00 pm yesterday (Sunday March 7th 2010) looking toward the Catalina Mountains. 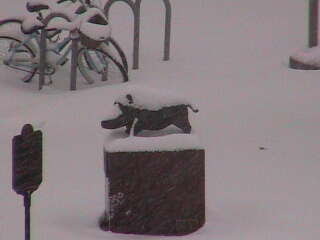 around 0.30" to 0.50" with heavier amounts at higher elevations, where 5 ALERT gauges are reporting 1.00" plus amounts. This is the second significant storm event without radar data across southeastern Arizona and it has been greatly missed, at least here. Radar has been down 10 days now. 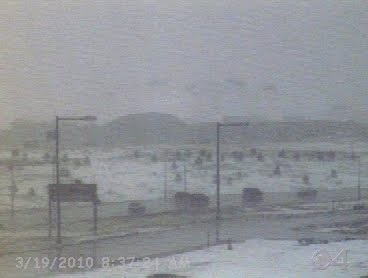 To add insult to injury, the NWS TUS ASOS surface observing system at the airport also failed yesterday and it too remains out of service this morning. Finally, another BAD forecast in the Sunday paper yesterday morning - KVOA and/or AccuWeather again ignoring the NWS forecasts of 100% chance of rain and telling the soggy Star readers that there was a 60% chance of showers for Sunday. That's 3 of last 4 Sundays with really bad forecasts in the paper - the one weekend when there was no weather of any kind, except sun and warmth, is the only time the Star forecast was accurate. Way to go guys. Visible image above shows intense convection embedded right in the core of the cutoff low off Northern Baja, as well a second squall line to the east of the center - will be interesting weather watching for the rest of the weekend! The two NAM 36-hour forecasts above are valid at the same time as the two 84-hour forecasts shown in post below. Very consistent, with just a bit of slowing in the forecast progress of the 500-mb S/W across the Southwest. Considerable cloud cover moved into Arizona since yesterday afternoon and the weekend is progressing much like a week ago. Note that the more recent forecasts above are picking up more moisture from the south than did the earlier forecasts. But again, very impressive model performance! Unfortunately, the Tucson NWS radar remains out-of-service and we may have a second significant precipitation event without any radar data for southeastern Arizona. Latest status message reports that Sunday would be the earliest radar could come back on-line. A Grid Forecast for Kitt Peak - Sunday Night: Snow showers likely. Mostly cloudy, with a low around 33. Breezy, with a south southwest wind between 13 and 20 mph, with gusts as high as 29 mph. Chance of precipitation is 70%. New snow accumulation of 1 to 3 inches possible. A Forecast Question - I see this kind of forecast frequently when I look at the grid point forecasts (grids are 4 x 4 km I think). Since the grid is so small, this is essentially a point forecast and it is not clear how the general public would or could intreprete this forecast. Comments or clarification most welcome. Another Cold and Wet Sunday? The top figure shows the NAM 500 mb forecast from 12 UTC this morning valid at 84-hours, which is 5 pm Sunday afternoon. The model forecasts a very sharp S/W to be moving across Arizona on Sunday. The wavelength is quite short, having been pinched down by the S/W to its northwest, and to some degree by this morning's S/W which has moved out to Illinois and become nearly a mesoscale feature. The bottom panel shows NAM 84-hour SLP, 1000-500 mb thickness and 6-hour accumulated precipitation - so yes, the NAM says cold rain on Sunday. However, timing may be a crucial issue for this feature, since the ECMWF has been consistently slower with it. The very cold air at 500 mb leads to a fairly large area over AZ with thicknesses below 540 dm. This needs to be monitored, since thicknesses this low would bring the snow level down quite low (need 534 dm or a bit lower to see snow here at the house but we're one of the lowest elevations in the metro area). As the system digs down the coast in the model forecast an area of thicknesses less than 528 dm makes it far south down the California coast. The final question with this system concerns the subtropical moisture to the south - at least three of the GFS ensemble members seem to pull this air into the system and predict much larger precipitation areas on last evening's runs. So, lots to watch as the synoptic pattern rapidly evolves over the next three days! Two 500 mb data plots for 12 UTC this morning - Thursday March 4, 2010 - are shown above. The lower panel shows the weaking cutoff and S/W that is currently over the Great Basin. This feature moves by during the day today, brushing northern Arizona. Satellite imagery this morning indicates the only cloudiness with this system is currently over far northwest Arizona. The top panel extends far enough north to show Alaska - it is of interest that 500 mb temperatures are very cold over the Gulf of Alaska, -35C to -40C. The models forecast the next feature to impact Arizona will dig southward from the Gulf tomorrow and Saturday, pulling some of this very cold, middle level air along with it. The Short-Term Details Can Be Tough! First - view of the Catalinas this morning showing that the snow level came down fairly low before the precipitation event ended yesterday. 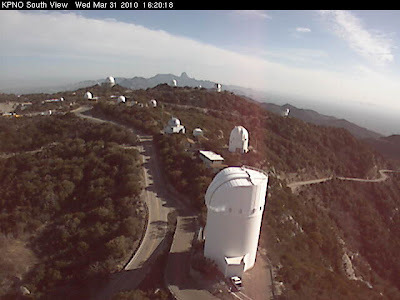 Note the Kelvin-Helnholtz waves on the top of the cloud sitting on Mount Lemmon. Following up on Chuck's comment on predictability below. The event that ended yesterday evening was amazing well-forecasted by the models - although the NAM appeared to under-forecast the QPF, it did correctly forecast the bulk of the precipitation to fall after 5 am on Sunday. Moderate to heavy rains fell during the mid to late morning doubling and tripling the early morning amounts. Here at house we ended up with a total event rainfall of 0.92" by late afternoon. We drove across town from east to west between 10:00 and 11:00 am and the rain was really coming down, with ponding and rivers running down some streets - quite something. However, there seemed to be problems in telling users the correct details about what was going on - this may have been related to the fact that the NWS radar went down around midnight on Saturday night and it remained out-of-service this morning. So, a significant event transpired with no radar information available for southeastern Arizona. An urban and small stream flooding alert was issued an hour or two after our drive through the flooded streets. I've been poking at the Arizona Star and KVOA for their (or AccuWeather's) really bad forecasts 2 out of the last 3 Sunday mornings. So I was interested to see what was in yesterday's paper - and the banner forecast had an 80% chance of rain for yesterday. Not bad and close to the 100% NWS forecast that I found online for our grid point at around 7:00 am. A bit after this a winter storm warning was posted at 7:40 am for the mountains, which seemed a tad late given the winds and snow that had already swept through - again perhaps this was partly due to the lack of radar information. When we got home I checked online and found that the POPs had been reduced to 40% on the morning update around 9:30 am - clearly the wrong way to zig, given that rain amounts continued accumulating until late afternoon. Related to the radar problem? Finally at 3 pm I noticed that POPs for our grid point had come back up to 50%. So, yesterday the immediate details proved more difficult than the long-term, large-scale forecasts leading up to the event. Regardless, February has now closed out with total rainfall here at the house of 2.78 inches. The rainfall for 2010 has been an impressive 5.74 inches here at the house. No wonder dangerously deep potholes seem to be everywhere!